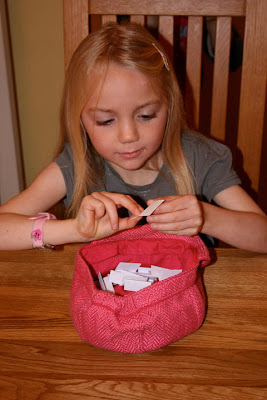 I was going to use a random number generator to choose the winner for my beaded fob giveaway, but while I spent a lovely evening on Friday with my sister Sarah, watching a DVD with a Chinese takeaway, I had my gorgeous little niece Charlotte pick a number for the winner from a hat instead. 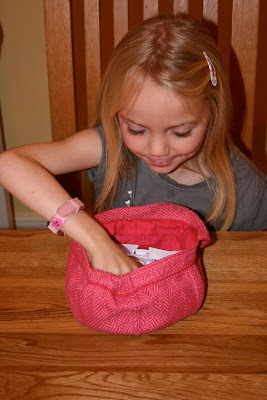 Here is Charlotte picking a number from her hat. 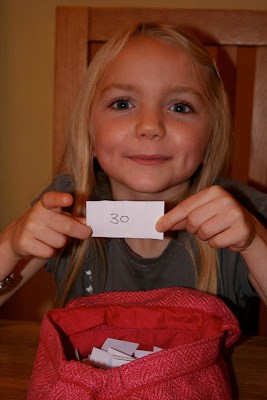 And the number Charlotte picked was NUMBER 30! CONGRATULATIONS ANGI, YOU ARE THE WINNER!!! Yours was the 30th comment left on my giveaway post. I will be in touch with you soon for your mailing address so that I can send your beaded fob to you. Thank you so much to everyone who took part in my first giveaway and to Charlotte for helping me pick a winner. The draw from my beaded fob giveaway is now closed. I'm a little busy at the moment as DH Colin is due home tomorrow after being away for 7 weeks, so I will draw a name and post the winner sometime over the next couple of days. My very first blog giveaway! It's only a little something, but I hope you will like it enough to want to join in! It's another first! 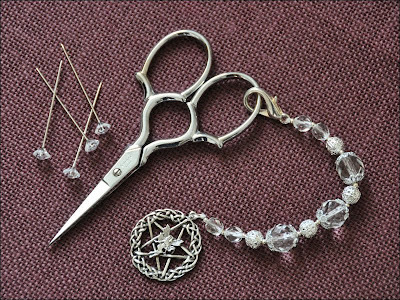 My first try at making a beaded scissors fob, following the tutorial on the Focus on Finishing blog. I am really happy with how it turned out and will definitely be making more! As October is breast cancer awareness month, and also with me earlier this month attending my first breast cancer screening, I have made a breast cancer awareness fob. The beads are silver plated and Swarovski crystal, and Spiral Rose Silver Murano Glass Beads. The awareness ribbon is sterling silver with the words breast cancer stamped on the back. Anyone, anywhere is welcome to join in, whether you are a regular visitor or new to my blog. If you would like to be entered into the draw please leave a comment to this post only. I will also need an email address so that I can contact you if you should win. If it is on your blog, that's fine I will be able to find it, or you could leave a note of it with your post. I will draw a winner one week from today, on Thursday, 29th October and will annouce the winner soon after. 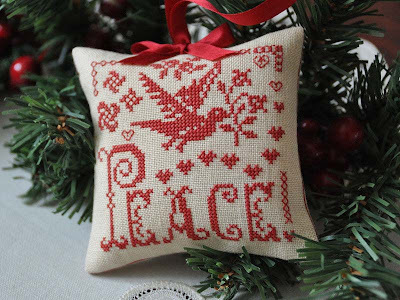 I've now finished making up all three of the Peace, Love, Joy ornaments by Renato Parolin. I stitched them all back in April but had only finished Joy (more pictures of Joy can be seen here). It's lovely to see them now all finished together. I've changed the listed fabric and thread and have stitched them on 40ct R & R Light Espresso Linen, 1 over 2 with DMC 347. I've added the date to the back and finished them off with silk ribbon for the bow and hanger. 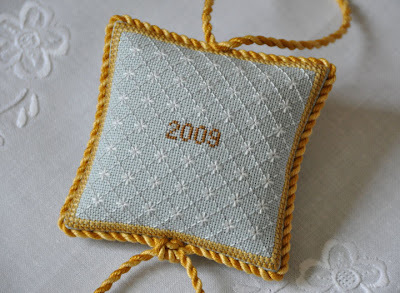 It's not my first floss ring tag but it is my first with an eyelet following Staci's wonderful tutorial! I was going to use my Crop-A-Dile but instead used my Prym Vario Pliers for piercing both the hole and setting the eyelet and I have to say I think they did both jobs brilliantly. The pliers come with the attachments for piercing holes which can be removed to attach the appropriate fittings for setting eyelets, etc. The fittings are included in the Prym eyelet packs. 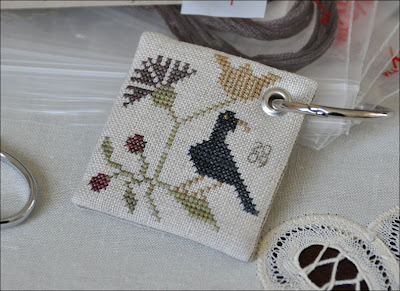 The design is Bird & Flower, a complimentary design from Chessie & Me currently in the May 2009 Stitchville USA newsletter. 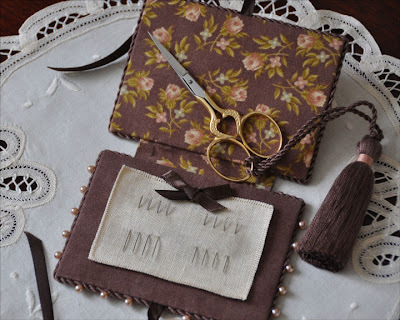 The May newsletter is still up on the Stitchville USA website but may not be for much longer. I've changed the fabric to 40ct Flax Newcastle Linen stitching 1 over 2 using the listed Gentle Art Sampler Threads. I added the tiny date with 1 over 1 backstitch. I've actually finished another of the many pieces I have stitched that are waiting to be made up. 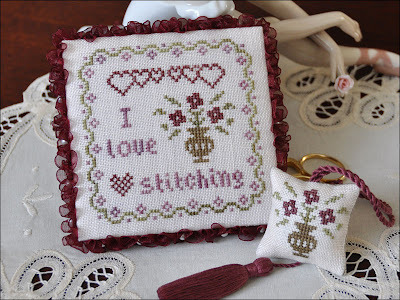 This is 'I Love Stitching' pinkeep by Maryse Dupont, from The Gift of Stitching, issue 30, July 2008. I stitched this last year so it's been hanging around for a while. The wording on the chart was different to the picture of the finished pinkeep but I have stitched mine like the picture as I liked it that way. I've used 32ct Country French Chantilly linen with the listed Gentle Art Sampler Threads and have added a little pleated pocket to the back for stitchy bits and bobs. This is the first time I have added a pocket to a pinkeep and was really pleased with how it turned out, especially with the pleats. I have wanted to do one for ages and saw a pocket finished this way with the pleats, for a sewing case in an older issue I have of SANQ. After finishing the pinkeep I decided it needed a little matching scissors fob too! Yippee! A Finish At Last! 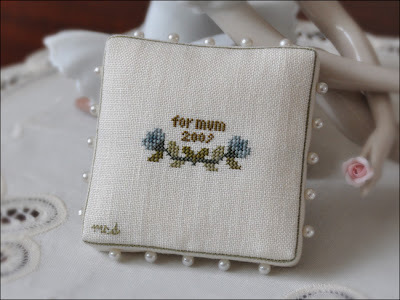 It's taken me so long to get round to finishing this little gift that I'd almost forgotten whether it was a little extra something for my Mum for her birthday in May, or for Mother's Day back in March...lol! 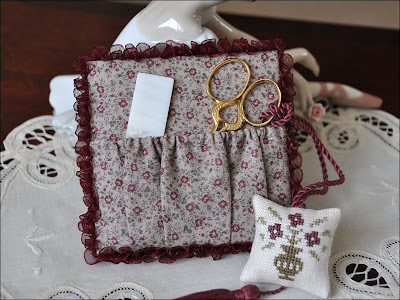 This is the first time I have stitched anything from Mary Beale and must confess that I had never heard of her until I had seen Su's beautiful Mary Beale finishes that she has posted on her blog. This design is from Pocketbook No. 3, October 1989. 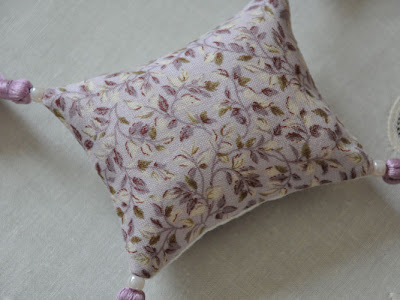 I've used 40ct cream Newcastle linen with the listed DMC threads and finished it as a mattress pincushion. There's not been a lot of stitching or finishing going on here since Colin arrived home. I've not spent a lot of time on the computer either, wanting to make the most of having him home, before he is off again for another 6 weeks towards the end of the month. 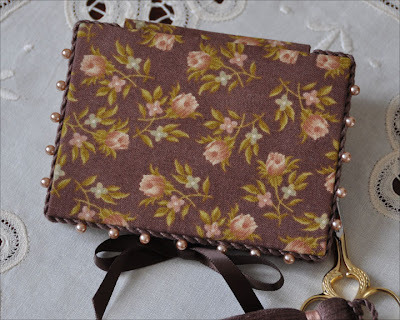 I have managed at last though to finish putting together this needlebook. I had started making it up a month or so ago so it feels like it's been hanging around forever! The design is another A Mon Ami Pierre freebie which can be downloaded from here. I've stitched it 1 over 2 on 40ct Light Espresso R & R Linen with DMC 779 and made a matching tasseled scissor fob. The fabric for finishing is from Blackbird Designs Harvest Home. I've had this one on my 'to do list' for ages! 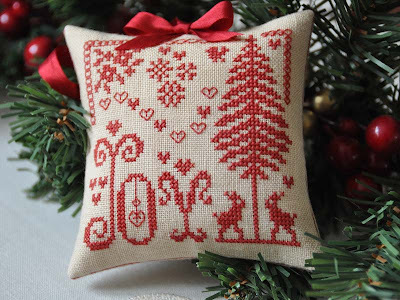 It's one of five designs called A Touch of Holly by Teresa Wentzler from the December 1996 issue of Just Cross Stitch. The chart also includes a bell, heart, star and fan and gives instructions so that they can all be finished together as a bellpull. 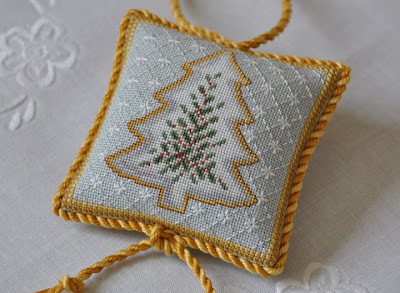 I think I shall probably one day just stitch a couple more of the ornaments though. 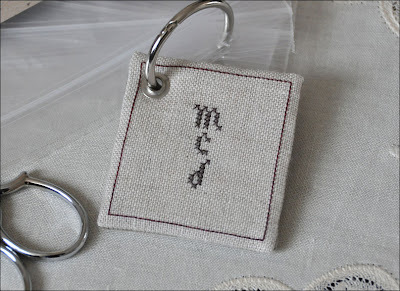 I've stitched it as the chart recommends using DMC threads on 28ct Dove Grey Monaco from Charles Craft. 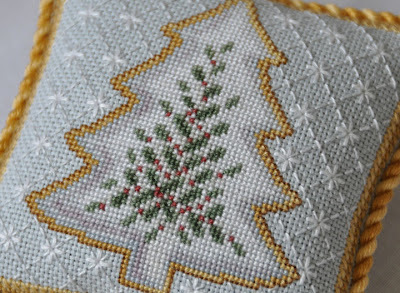 The border and background pattern are stitched over 2 and the tree was done 1 over 1. For the back I used the same background pattern as the front and also added the date. It's good to see a few of my finishes actually getting completed at last! I still have a few more to do though! Hope everyone has been enjoying their Bank Holiday weekend. I'm having a nice quiet day here. Youngest DS Matthew who is studying at Brighton University came home for a visit on Friday but left to go back again yesterday. It was lovely to have him home even though it was only for a short time. I'm getting very excited - only 11 days left before DH Colin is back home again for another 6 weeks!! 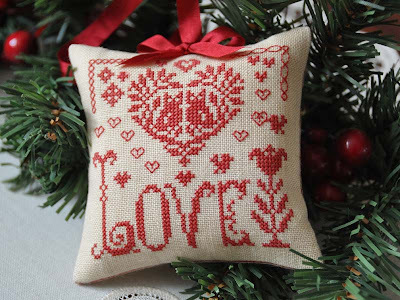 Today I finished putting together the first of the Peace, Love and Joy ornaments by Renato Parolin an Italian designer, that I mentioned I had stitched in an earlier post. 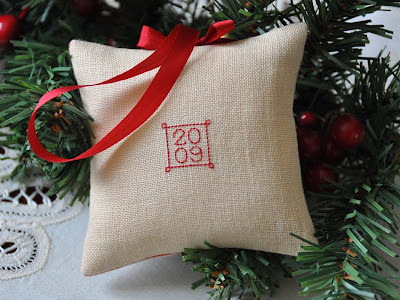 I changed the listed DMC to 347 and as I want the ornaments to be finished a little smaller then the models on the chart I have stitched them 1 over 2 on 40ct Light Espresso R & R Linen. The front and back are joined together with whip stitch and I have also added the date to the back. I'm looking forward to having all three completed but will probably finish Peace and Love between other finishes that I still have left to do from last year! Hope to have more to show soon! This week I decided it was about time I put together this pinkeep. 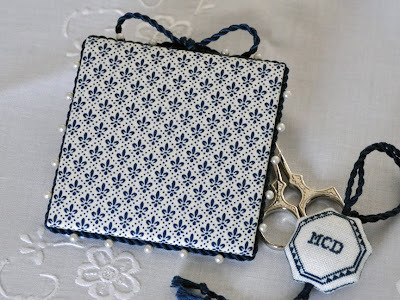 I finished stitching it last summer and made a little scissor fob to go with it too using the centre motif of the design. I have also added my initials to the back. 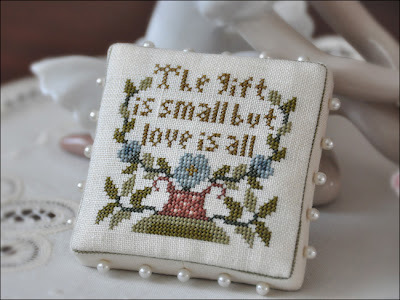 The design is an A Mon Ami Pierre Quaker freebie which was given to me by a dear friend. I've stitched it 1 over 1 on 32ct Belfast Antique White Linen, using DMC 3750. I can not believe how long it's been since my last post! Both me and my computer have been very poorly. I started to become unwell some weeks before Christmas and became worse at the start of the New Year. Then just into the New Year and only two days after DH Colin left to go back to work overseas for another 6 weeks, my lovely Sony Vaio went down with hardware failure. It was only 6 months out of warranty and Sony were quoting an arm and a leg to take it in for repair, almost as much as it would be to buy a new computer, which is what we ended up doing. I'm now on a new 24" iMac. I'm loving it and having fun finding my way around the new OS as I have only ever used Microsoft before. I'm not fully 100% yet and still having to pop back to see the doctor from time to time, but I am now having more days where I feel so much more like myself. Colin has been back home for his time off and last Monday left to go back to work again for another 6 weeks. I am getting excited about my stitching again which I've not felt much like doing while I've been unwell. 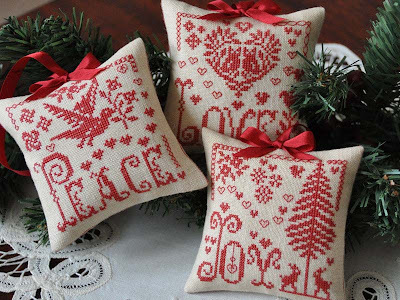 Recently I finished 3 ornaments from the chart Peace, Love, Joy by Renato Parolin an Italian designer. They still need making up but you can see a picture of the chart here. I've also noticed since finishing them that Amy (DSL) now stocks them. I have quite a few pieces I finished last year which I never got around to making up, which I'm looking forward to doing and hope to show soon. I have one small finish that I can share for now though, which I made for my Mum. She should have had it along with her present for Mother's Day but I never even managed that in time and only made it up a couple of days ago. 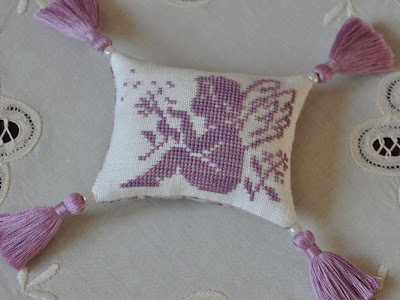 The design is a freebie by Ariane Jean Pierre which I have stitched on 32ct Antique White Belfast Linen with Polstitches Romance Dragon Floss. For the tassels I used DMC 3836.